Mark Zuckerberg has been granted a permanent restraining order against the California man the Facebook CEO has accused of stalking him. A temporary restraining order barred Manukonda from going within 300 yards of Zuckerberg and his girlfriend Priscilla Chan. It also ordered Manukonda to halt e-mail and Facebook contact with the 26-year-old billionaire and to stay away from Zuckerberg’s home and offices in Palo Alto. Court records show that a permanent restraining order was issued a week before a scheduled February 22 hearing in front of Judge Socrates Manoukian. It appears that Manukonda, who did not respond to a message left on his voicemail, did not oppose the issuance of the permanent restraining order. Though termed "permanent," California law only allows judges to issue restraining orders of up to three years in length. Zuckerberg was prompted to file for the original restraining order after Manukonda sent him a series of troubling messages asking for help and claiming he was “ready to die for you.” Manukonda also repeatedly sought to meet the Facebook boss at his home and office despite warnings from the police and Zuckerberg’s corporate security team. Submitted by sfbadger on Wed, 2011-03-02 15:36. Sounds like Loveourvets has a little jealousy thing of his own going on. Submitted by newguy on Tue, 2011-03-01 11:46. Submitted by infectious groove on Tue, 2011-03-01 09:59. Submitted by Loveourvets on Tue, 2011-03-01 17:37. Oooo, sounds like the stalker might still be defending Zuckerman....is that you, Pradeep? Or maybe 'infectious groove' is really Zuckerman himself. And it sounds like someone thinks Facebook is actually good for society when truth be known, more and more people are deleting their pages because of privacy issues. Sure, Facebook was used by the various protestors recently, but much of that has resulted in violence. Why would I be jealous of Zuckerberg when I'm glad he was able to make millions (billions?) thanks to capitalism that our great country has put in place so that we all have an opportunity to prosper. I just find it ironic that the left uses Facebook to try to bring down capitalism and to promote communisn. Submitted by Loveourvets on Mon, 2011-02-28 19:09. Zuckerberg actually has a girlfriend? Oh yeah, I forgot...he's rich. I hope his sister is better looking than he is. The nutty stalker was stupid enough to have a Facebook page while stalking the guy who runs it. 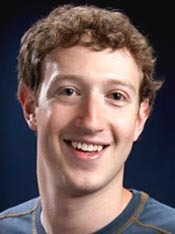 My theory is that poor Zuckerberg hardly had any friends growing up, so he 'created' Facebook to remedy the situation.